Who’s ready to break out their flipflops and sandals? After a loooong Michigan winter, I am quite ready for summer. Actually, spring isn’t even in full bloom yet here in the northlands. My box of warm-weather clothes waits to be unpacked. Sophie-cat sharpens her claws on it while I watch the rain and check the forecast and browse for sandals online. Whether you’re waiting like me, or already walking barefoot to check the garden, now is the perfect time to pamper your feet and get them ready to be on display a bit more. 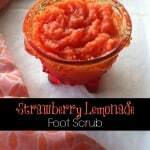 A foot scrub is a great way to exfoliate your feet and slough off dead winter skin. 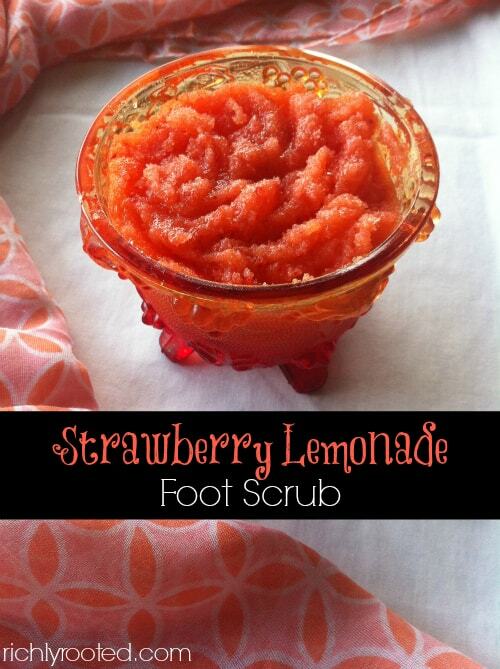 I whipped up this batch of strawberry lemonade foot scrub–and it smells heavenly! It’s a great recipe to wake up tired feet. Massage this into your skin and you’ll want to paint your nails and slip on sandals and go places! And why not? Let warm weather beckon your feet to the Road. 2 tsp of your favourite oil jojoba, almond, olive oil, etc. Cut off the tops of the strawberries and chop the berries into small pieces. Mix all ingredients together in a bowl. Store foot scrub in a lidded jar in the refrigerator. To use, massage foot scrub all over feet. Let sit for a few minutes, then rinse off with warm water. This batch makes enough scrub for a couple of foot massages. Store leftovers in the refrigerator! 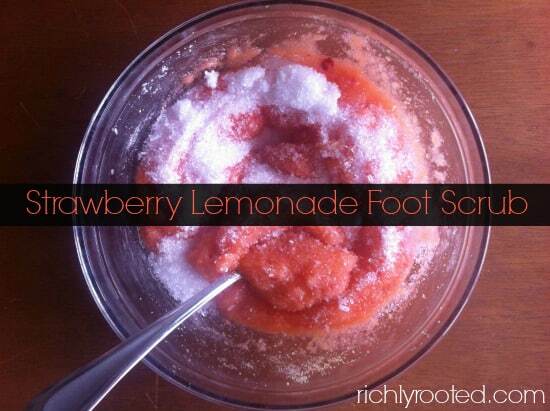 Want another luscious DIY scrub? Try this moisturizing honey vanilla body polish! Wow! This is so awesome. I thought I had seen all foot scrubs. Would love it if you will share this at Oil me up Wednesday at My lamp is full! Looks like an awesome teacher appreciation gift! !